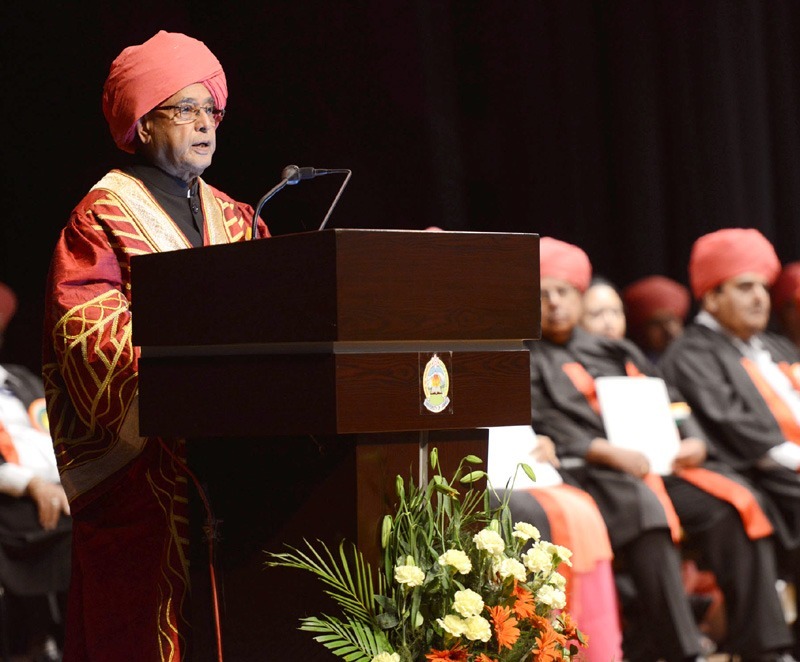 The President of India, Shri Pranab Mukherjee attended the 14th Convocation of University of Jammu today (September 1, 2014) at Jammu. Speaking on the occasion, the President said universities today need to become drivers of innovation. Their focus should be on collaborative relationships with industry and Government. Entrepreneurial activities in the universities could take various forms such as contract research, consultancy, patenting, licensing, spin outs, start-ups, incubating companies etc. It is essential that Universities create the right environment for promoting entrepreneurship amongst students as well as academicians. The President congratulated the Jammu University on it being listed as one of the twenty nine universities in the country under the “Promotion of University Research and Scientific Excellence”(PURSE) programme of the Department of Science and Technology, Government of India. He also congratulated the Jammu University for its involvement in world class research through participation in ‘A Large Ion Collider Experiment’ (ALICE) collaboration as part of the Indian team involved at the Large Hadron Collider (LHC) Experiment at the World Laboratory ‘European Council for Nuclear Research’ (CERN), Geneva. He said the setting up of the National Apple Germplasm Repository at its campus in Bhaderwah is indeed an important step towards conservation of an important genetic resource of the country. The University has also hosted, for the first time ever in Jammu and Kashmir, the 101st session of the Indian Science Congress. These recognitions are a tribute to the quality of leadership as also, in equal measure, to the untiring efforts of the faculty, research and technical staff, students and all other stakeholders. The President said the State of Jammu and Kashmir is emerging as a knowledge hub in the country with nine universities and more than 300 affiliated colleges. All these institutions would benefit by collaborating in teaching and research and establishing common research facilities. He called upon the University of Jammu to move towards establishing research clusters to enable scholars and faculty members to explore emerging research areas, especially related to local and regional needs, and to collaborate with industry and research organisations.